It was in 2015 that the workers of iniquity finalized the evil work on Nigeria and set it on that short road of destruction. It was on that same year that evil bought over few men of integrity and inducted them into the evil hall of fame. That was when men like Femi Falana and Wole Soyinka swallowed their dirty vomit and started dinning with the king of all the devils. What has befallen Nigeria today does not in any way perturb me much this days, if not that it adversely started affecting those from the East, the Biafran people. The politicians have succeeded in caging the people to the extent they now believe that victory can only come from same politicians that have been dealing with them for ages without rancor. My interaction with a former Biafran agitator turned "Atikulator" showed that the only reason they can give for campaigning for Atiku is simply because Atiku will be better than Buhari. Yes, Atiku will definitely be better than an abysmal failure like Buhari, but the question is ....HOW BETTER? Will Atiku be a success or will he just still be better than Buhari in the same level of failure? Your guess is as good as mine. What will limit Atiku are things you all have ignorantly failed to acknowledge. And that is the feeding bottle system of government and the constitution, yet you all are adamant about it. Didn't the devils that supported Buhari's reign as the Nigerian President clamored for the suspension of the constitution for Buhari to function effectively? They needed more power for the President apart form the ones the useless constitution accorded to him. Maybe the present broods of vipers supporting Atiku will ask for the same thing. What can you tell a people who have forgotten their struggle, forgotten restructuring and are only voting to be alive. Alive doing what? Living a life of slavery? I can see the doomsday drawing nearer and nearer. The Pandora box, that box of evil is full and will soon explode with all evil inside it being unleashed on this country. No sector of the country is working. The soldiers under this government have died in their hundreds in the hands of world's most dreaded terrorist group, BokoHaram. No recognition for them, no decent burials for the fallen heroes, simply because the government has bought everybody up, including the media so as to keep mute and keep lying to the people. Boko Haram now kills and releases video where their victims are being slaughtered to inform Nigerians about the atrocities they committed and for the media not to doctor or edit the complete story knowing that Nigeria media have compromised. Similarly, the government has been releasing captured Boko Haram members in their droves, fed them, rehabilitated them, paid them money, recruited them in the army and in most cases reintegrated some of them into the society. The government that did this to terrorists have also gunned down peaceful protesters, arrested them and charged them with terrorism albeit not shading any blood of the innocent. In Zaria and Abuja the Nigerian government via the military have in four years killed more than 1000 Shiite Muslims for protesting and demanding for the release of their leader. IPOB members who are demanding for referendum to determine where they want to belong have been killed and imprisoned in many detention centres across the country without trial while some have been kidnapped and taken to unknown destinations for summary execution. Apart from all these, corruption is another thing that has eaten deep into the fabrics of the Nigerian state. It won't take long before the long awaited revolution kicks off. This revolution will see many soldiers desert and take up arms against the government. It will see the Shiite Muslims defend themselves against the government that wants to wipe them off. Middle belt will rise up and fight their way against the herdsmen that wants to kill and takeover their lands. 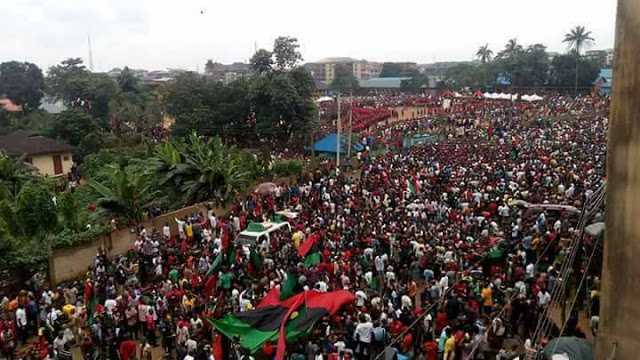 While all these are happening, new nations will be sprouting up from the East and with it Biafra will be born.